Ananka's Diary: Ah, the Good Old Days . . .
You read right. The 1898 discovery of the radioactive element radium by Marie Curie (who may have suffered from Uncombable Hair Syndrome) quickly led to the launch of countless products that were said to do a body good. 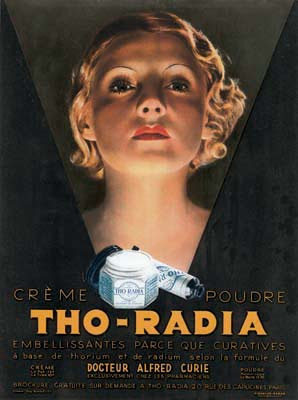 Radium became the secret ingredient in tonics, face creams, toothpaste, and suppositories that were sold well into the 1930s. There was also delicious Radium chocolate (shown below), which claimed to rejuvenate those who ate it (but probably just dissolved their tongues). According to Fogonazos, small amounts of radium were even added to tea, ice creams, lipsticks, bath salts, and Halloween costumes that glowed in the dark. Most were eventually pulled from the shelves, but not before they sickened (or killed) many an American. I don't even want to think about what happened to the people who purchased those suppositories. Of course radium wasn't the only harmful chemical that was sold in pharmacies. Cocaine and morphine were once wildly available. There were even opium-based baby medicines with names like "Mother's Helper" that claimed to help with teething pains! Poor little tots. They were drug addicts before they could speak. I've heard of most of those, except for the chocolate. You wouldn't think it would take that long to realize how dangerous radioactivity is. D'you think this might be the origin of the word "radiant?" i have acutally heard of the chocolate before. i never really knew what it was untill i read an article abotu radioactivity on the internet. That is so sick[bad way, not good]. I know for a fact women used to use arsenic to beautify themselves. What is it with health products and deadly chemicals/elements? "Hmmmm, a spot of radium will do the trick ;)"
Well, but perhaps the suppository kept any odors at bay: by killing off all of the bacteria, wouldn't you eliminate the methane production? There are benefits! Seriously: it makes you wonder what else might be found to be hideously bad for us - natural as well as manufactured (because radium is natural, isn't it?). Suppositories. Whoa. Nothing like bowel cancer direct. Makes me wonder: did people's ...poop glow? there were probably a LOT of little Spidermen and Wonder Women running around. Davimack & Tadmack & Dangerous: Hilarious AND Insightful! wow. scary. if you go to target, in the 'return your items' area, on the side of the wall is a list of objects that were canceled because of dangerous aspects of it. you'd be really surprised if you knew how many baby toys contained lead. What is with alll these "health" products?! scary. makes you wonder if this is a plausible explaination for those of us with unusual "quirks".